Small Business School, Inc. - #4 Just fifteen steps up the scale to step 116, we find the child within. 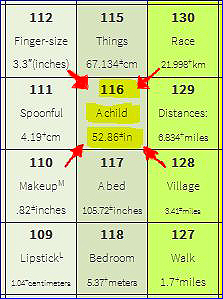 #4 Just fifteen steps up the scale to step 116, we find the child within. Human life starts right within that midrange, at Step 103, but we grow up and up into step 116, and just a few into step 117. The Planck Length has now been multiplied by 2, and each result by 2, over and over again, 116 times. This length is rendered here in inches (52.86) and meters (1.342864). Within this notation there are all kinds of very familiar things. We selected children to represent the category. Think about the birth cycle.Growth in nine months usually renders an infant mostly within Step 113 and usually through a birth canal. Most of us hardly give it a thought. Yet there are parallel constructs throughout nature. By approaching the entire universe as an ordered set, a group that has well-defined subsets, we can re-examine our presuppositions one more time; and in a very new way, look for new insights to old enduring questions. Key idea: Within this notation there are all kinds of very familiar things. We selected children to represent the category so you might suspend your judgment and become like a child. Engage the entire universe like you have never done before today. This discovery process will challenge your imagination and may press in on your belief systems. Please remind yourself that all these numbers are the result of simple math -- just multiplying each result by 2. It is also the process of following embedded geometries within two of the most simple, pure objects known to our academic community. We propose, and you will soon see, how these geometries pervade everything. But first, our mea culpa. Notes about Look-and-feel and Navigation: Usually if you click on the last sentence in each description you will go to the next page. 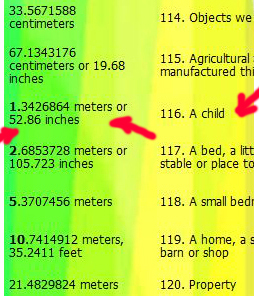 Sizes: The range for this notation goes from about 36 inches to 79 inches (6′ 7″ feet). So much of our life is within this notation. Each notation ranges from just under 50% larger than the Planck Length multiple (115) in the smaller notation (2.20 feet or 67.134 cm) to just under 50% smaller than the Planck Length multiple (116) in the larger notation (105.72 inches). Boundary conditions between notations are a key part of this study.